A pharmaceutical company which was granted a patent now the subject of revocation proceedings in the European Patent Office and in the Irish courts, has had its application for a stay on ‘discovery, the carrying out of experiments or the other interlocutory steps that will require to be taken in order to put the proceedings in a state of readiness for trial’ in 2019, refused in the High Court. The revocation proceedings were commenced by another company seeking to use the compounds as a treatment for Alzheimer’s disease, therefore Justice Denis McDonald said that there was a strong public interest in avoiding any delay in bringing the treatment to market, which outweighed any concerns raised by the patentee about legal costs involved in getting ready for a trial which may not be necessary depending on the outcome of the European Patent Office proceedings. In August 2015, Eisai R&D Management Co. Ltd were granted a European patent entitled ‘Condensed Aminodihydrothiazine Derivative’, by the European Patent Office. Pursuant to the arrangements established under the European Patent Convention, the patent granted by the European Patent Office applied to all member states of the European Patent Organisation – as such, under Section 119 of the Patents Act 1992, the patent took effect as an Irish national patent. The patent comprises compounds which are claimed as a treatment for neurodegenerative diseases. Of particular importance is that the compounds could potentially treat Alzheimer’s disease by inhibiting the production of amyloid-P. 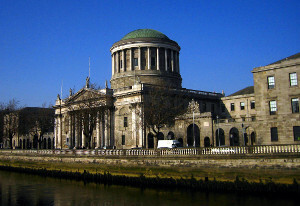 In the present proceedings, Eli Lilly & Company commenced revocation proceedings of Eisai’s patent in Ireland, arguing that the patent ‘does not enable the skilled person to achieve the invention to the extent of its claimed scope’; that ‘the claimed invention does not make a technical contribution and is not amenable to industrial application’; and that ‘it was not anyway plausible at the priority date that the invention claims was attainable’. The basis for Eli Lilly’s challenge to the validity of the patent is that it wishes to engage in its own independent development of amyloid-P inhibiting compounds and wishes to be free to make and supply new treatments for Alzheimer’s disease from its plant in Kinsale, Co. Cork. The patent is currently subject to opposition proceedings in the European Patent Office, however the European Patent Convention allows for parallel proceedings to be taken before national courts and therefore the present proceedings are in relation to an application made by Eli Lilly for revocation of the Irish patent. So, notwithstanding the possibility that Eisai’s European patent could be upheld in its entirety in the EPO – the present revocation proceedings could invalidate the patent in Ireland. Eisai’s patent has also been subject to parallel proceedings in relation to the UK patent, which resulted in Eisai deleting eight of its claim and amending a further six. Justice McDonald explained that these specific claims had been the focus of Eli Lilly’s challenge in the UK, and therefore Eli Lilly had obtained all that it had sought in those proceedings. In the High Court, Eisai made an application for a stay of the Irish proceedings – arguing that the proceedings would require investment of a ‘tremendous amount of resources’ which would not be cost-effective given the pending proceedings in the EPO. Eli Lilly opposed the application for a stay, emphasising the importance of commercial certainty – stating that the current revocation proceedings were of critical importance in terms of ‘path clearing’ for developing the site in Kinsale for global commercial manufacture of the proposed new compounds. Considering the application for the stay, Justice McDonald said that there was a strong public interest in the potential treatment for Alzheimer’s disease, which involved ensuring that the risk of any delay in supply of a potential treatment for such a devastating disease should be minimised to the extent that it is reasonably possible to do so. As such, the public interest outweighed Eisai’s concerns about legal costs. Distinguishing the present application from Merck & Co Inc v GD Searle & Co  3 IR 614; Justice McDonald explained that in Merck, the ‘the petitioner had the benefit of an undertaking that no infringement proceedings would be taken by the patentee against it pending the determination of the proceedings before the EPO’; and further, that the case did not involve a pharmaceutical product of ‘potentially ground-breaking nature in the treatment of a disease which causes so much discomfort and unhappiness as Alzheimer’s’. Even considering the fact that there was nothing to guarantee the success of the treatment, Justice McDonald said that the chance of developing a potentially life-changing treatment tilted the scales significantly against a stay of all steps in the proceedings. Justice McDonald said that it was ‘even more important’ that the costs estimated by Eisai of around €2 million had to be ‘weighed against the uncompensatable losses that may be suffered by Eli Lilly if it is delayed in the launch of a potential treatment for Alzheimer’s disease in the event that it ultimately succeeds in revoking the patent either here or before the EPO… In short, there is no “come back” for Eli Lilly in the event that it establishes that the patent is invalid and it successfully develops a treatment for Alzheimer’s disease but is delayed in the launch of its new treatment by the existence of a patent which is subsequently found to be invalid’. Stating that a stay should not be imposed on anything other than the trial in this case – Justice McDonald said that the stay on the trial should continue until after 30 November 2019 in the hope that the EPO will have issued a decision by then. With a strong emphasis on public interest throughout the judgment, Justice McDonald refused to grant an order for a stay on ‘discovery, the carrying out of experiments or the other interlocutory steps that will require to be taken in order to put these proceedings in a state of readiness for trial’.